Domenico, is a Certified Plumber with more than 40 years of practical experience, including a variety of roles within the Plumbing industry, ranging from general construction and plumbing contracting, to business development, standards and codes advancements, and corporate management. Domenico is a member of the World Plumbing Council, and the International Association of Plumbing and Mechanical Officials. During the course of his career, it was sadly apparent that millions of people lacked access to safe drinking water and sanitation, a leading cause of disease and poverty in the developing world. Domenico made a personal commitment to try and use his skills to help those suffering from water and sanitation poverty. He also learned that many of his fellow Plumbers felt the same way, but lacked a method of easily accessing an organization that would be a good fit for their services. 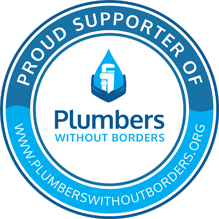 Plumbers Without Borders was born to answer that call, connecting Plumbers around the world to unite and share their skills to alleviate human suffering and increase global health. As co-founder, Domenico also serves as Chair of the Board, and President. Fred is a Certified Plumber with more than 40 years of practical experience in the Plumbing industry. Fred has been actively promoting the advancement of Plumbing Standards and Codes throughout his career, with an emphasis on global health. Fred served as Chairman of the local Chapter of the International Association of Plumbing and Mechanical Officials (IAPMO) in Seattle for many years and currently serves on the Washington state Building Codes TAG committee for plumbing. Fred retired from the City of Bellevue, WA, as a Plumbing and Mechanical Inspector, and is also a retired Certified Plumbing Instructor for the United Association of Plumbers and Pipefitters Local 32. Fred continues to advance and promote Plumbing Standards development and the need to provide and protect water systems, both nationally and internationally. Fred’s leadership and advocacy for protecting and increasing global health through safe sanitary systems helped to establish and continue to guide Plumbers Without Borders. As co-founder, Fred also serves as Vice-Chair and Vice-President. Carmela has been involved in the Plumbing industry working with her husband for more than 35 years. Born on a poor farm in Italy, she developed a respect for water at an early age, fetching water with her Mom from a hand-dug well which her Mom carried home in a copper urn balanced on her head. Carmela remains dedicated to seeing safe, clean water become a reality for all. Working with Domenico in numerous aspects of the plumbing industry, from field work to business development, Carmela built on their vision to help others who lack access to clean water and sanitation. As co-founder of Plumbers Without Borders, Carmela serves as Secretary/Treasurer, Program Services Coordinator, and assists with development and general operations. Judy is a Registered Nurse with over 40 years of experience in a variety of medical settings. She has always had a heart for the poor and disadvantaged people in our society. She began her career as a Visiting Nurse working in the slum area of Lancaster, PA, and finished it at the end of 2009, after almost 19 years with Public Health, Seattle & King County. In between, there were many years of mostly hospital based Maternal Child Health nursing, in addition to parenting her two children with her husband, Fred. Working for Public Health, she learned about disease prevention mainly through immunizations, worked with refugee populations new to the United States, and saw the effects of poverty first hand through patients at local Primary Care Clinics. As a Clinic Supervisor for the final 8 years of her career, she learned a lot about managing people, especially since the staff was almost as culturally diverse as the patient population. Judy’s goal in life has always been to make a difference. To that end, she’s currently enjoying several volunteer opportunities at her church and other organizations. Plumbers Without Borders is grateful to have Judy on the Board of Directors, recognizing her wealth of medical experiences, analytical skills, and comprehensive knowledge of safe sanitary systems, especially as related to disease prevention and global health. Allen Schauffler is a recognizable Seattle personality, having worked for the past 20 years as a reporter and anchor at KING5 TV, focusing on stories that impacted our community. An avid sports fan, he also covered 7 Olympic games during his tenure at the NBC affiliate. He later joined Al Jazeera America, as their Seattle bureau correspondent, and one of 12 news bureaus dotted across the country for the New York-headquartered network. Allen graciously joined our board as an early supporter of our mission and provided the initial critical boost with his coverage of our grass-roots activities and local community projects. His concern for people and our planet, coupled with his diverse and unbiased perspective are wonderful gifts he continues to share with Plumbers Without Borders. Fred C. Schilling Jr. is a Certified Master Plumber, Backflow Tester and Backflow Repair technician, CEO for Pipeline Plumbing in Florida, and Certified by The State of Florida Fire Marshal’s Office as a Fire Protection Contractor. He’s a member of numerous industry Associations, such as The World Plumbing Council, IAPMO, The American Society of Plumbing Engineers, and more. Fred was appointed by Governor Rick Scott in 2013 to represent the Plumbing Industry for the State of Florida, and also serves as a member of the Accessibility Advisory Committee and the Plumbing Technical Advisory Committee as Commissioner of The Florida Building Commission. Fred is a former U.S. Air Force Plumber, and member of the elite Red Horse Combat Construction Division, trained by the U.S. Navy Sea Bee’s and U.S. Air Force Civil Engineers. Throughout his long and distinguished career, Fred has been responsible for over 850 new construction Plumbing projects; over 225 major restaurants, hotels, office buildings, public schools, shopping centers, hospitals, high rise condos and apartment complexes; plus installed numerous pumping stations as large as 35 tons. Fred’s boundless energy, global plumbing skills and humanitarian passion have landed him as an inspiring and well-loved leader with Plumbers Without Borders. His recent missions have taken him to Haiti, in support of advancing their plumbing education and training. Fred currently serves as Vice Chair and Vice President of PWB.